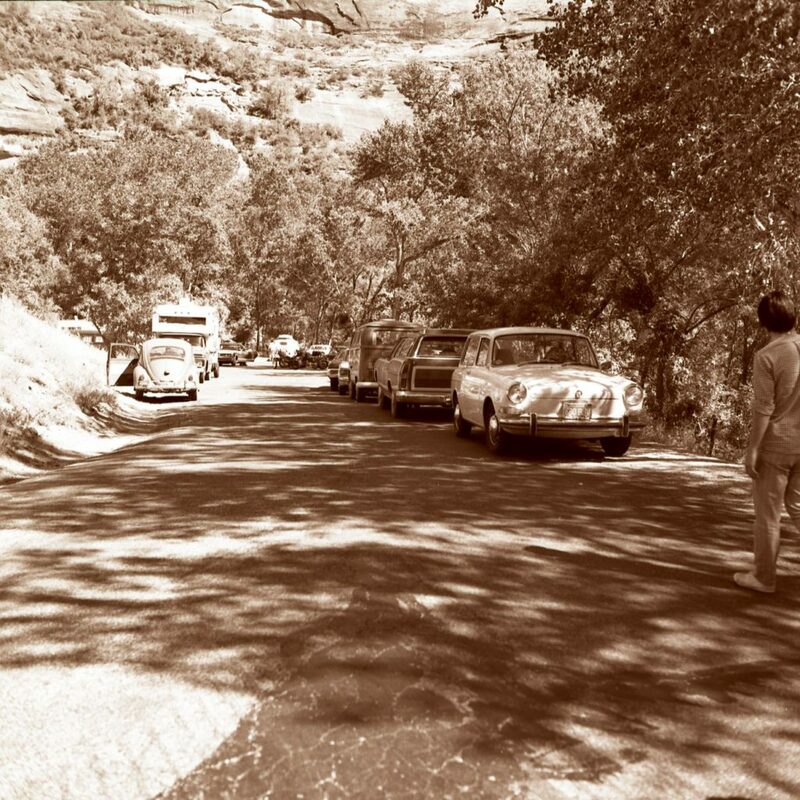 ZION NATIONAL PARK – At the inception of the National Park Service, Stephen Mather, the Park Service’s first director, and park managers wanted to expand facilities to attract more visitors to its parks. Now in the Park Service’s centennial, many park managers no longer need to attract more visitors as they come in droves without coaxing and nowhere is this more true than at Zion National Park. As a result, park managers today face a much different problem than their counterparts of a century ago. The question they are trying to answer is how the park can ensure visitors get a quality experience in the midst of crowded conditions. Visitors come to the park desiring a “wilderness experience” to escape urban life. Instead they’re experiencing overcrowding, long lines and a park that’s not as pristine as they might have envisioned when planning their trip – much like the urban environments they wanted to get a break from. Zion National Park is at the forefront of this debate over the National Park Service’s precarious mandate to preserve the park’s scenery while at the same time allowing more and more visitors to access it. 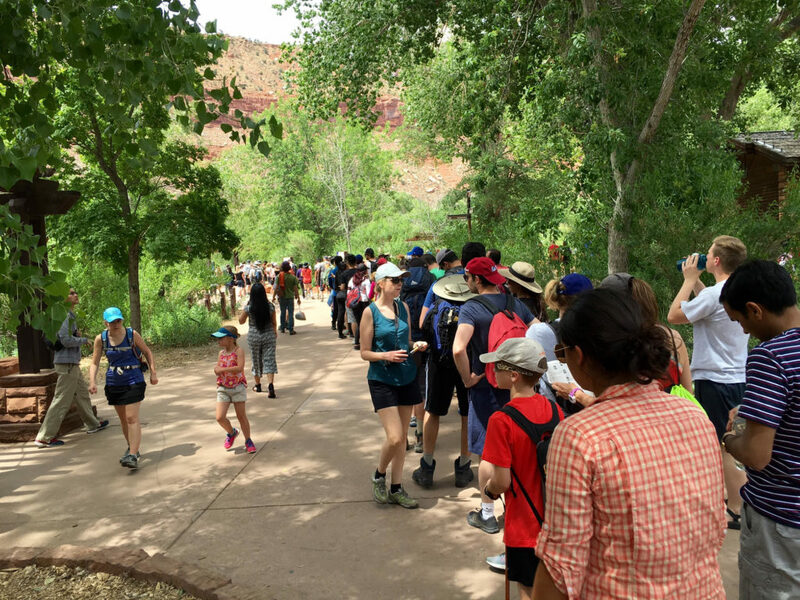 To alleviate the problem most want to immediately go to the solution phase, said Jack Burns, Zion’s chief of commercial services and partnerships and a near 30-year veteran of the park. But park managers have realized they must not jump to quick conclusions as they put together a new visitor use management plan. One of the main focuses in formulating the visitor use management plan is collaborating with stakeholders and listening to residents of surrounding communities. As such, park representatives held “listening sessions” in those communities in late May and early June. 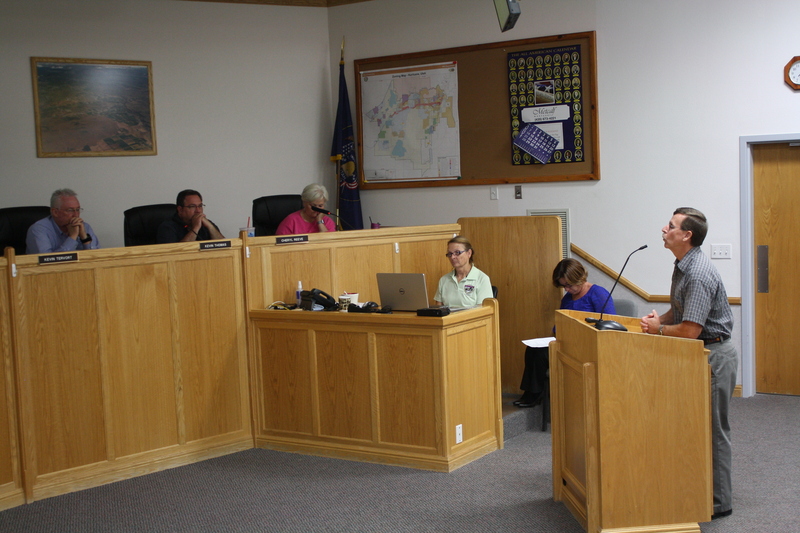 Zion National Park Superintendent Jeff Bradybaugh and Burns have also made the rounds within Washington County to help municipalities become aware of the problems, most recently giving a presentation to the Hurricane City Council Thursday. Burns said the park is trying to determine what its capacities are in terms of parking, shuttle, infrastructure and visitation. 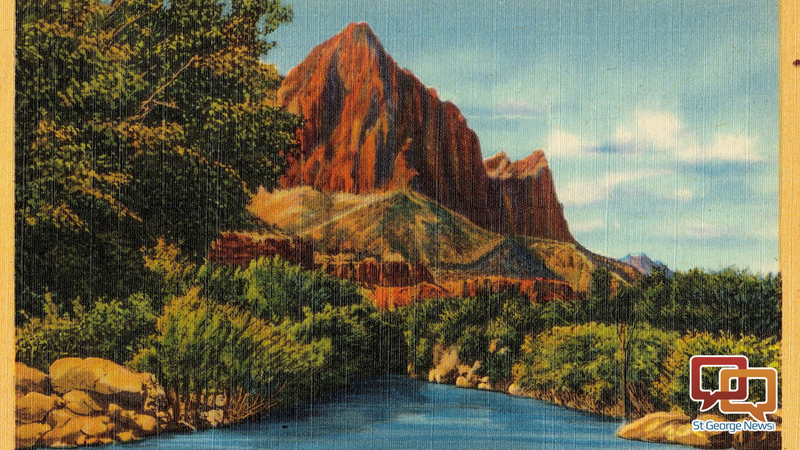 Bradybaugh said the park must determine what the capacity of Zion Canyon itself is such that the park can still provide a good experience for the average visitor. Visitation to Zion National Park has increased but the interpretation staff and the park budget is not increasing, Burns said. 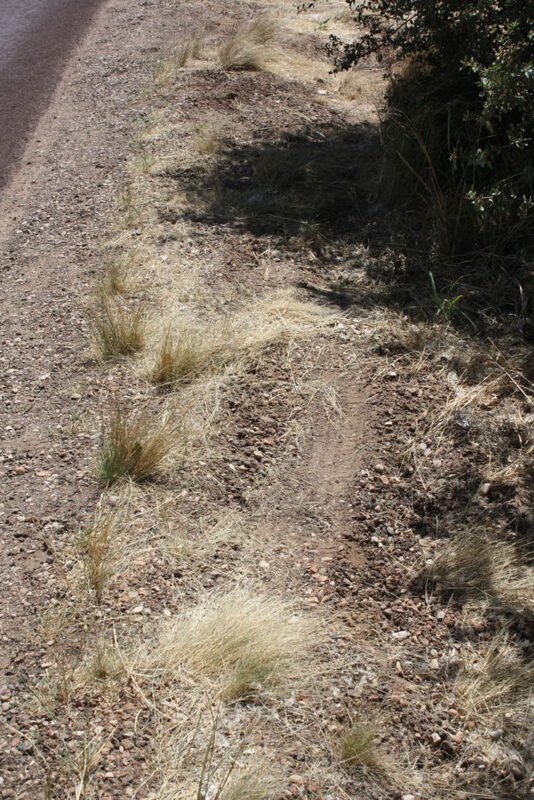 This leads to stress and frustration for park employees. When they come to work at Zion, Burns said, interpretive staff have no idea that they’ll be talking nonstop during their eight-hour shift. By the same token, visitors are not coming to the park expecting crowded conditions, both Burns and Bradybaugh said. This is because the pictures of Zion they see online while planning their trip do not reflect the reality they experience when they get there. Spring and fall visitation is increasing more rapidly than summer visitation, Bradybaugh said. More visitors are coming in the winter, too. 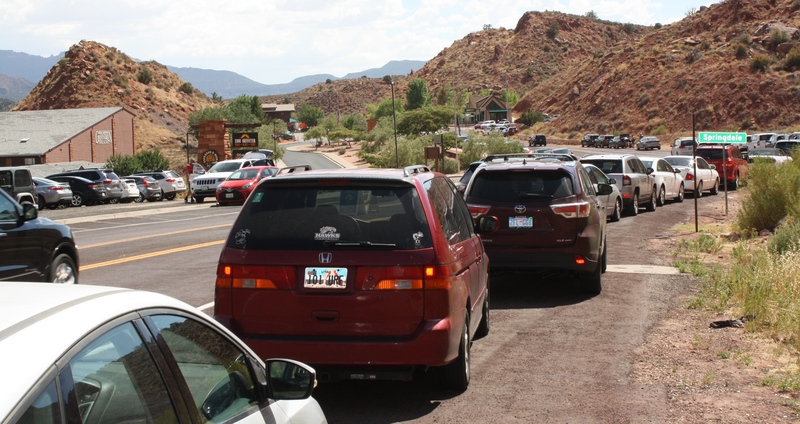 For instance, the nice weather during Presidents Day weekend this year led to summertime crowds which, without the Springdale and Zion Canyon Shuttles running at the time, led to a lot of congestion. Despite this trend, Burns said that the park still receives a lot of positive comments when it comes to visitor satisfaction. “People adapt to crowded conditions,” he said. 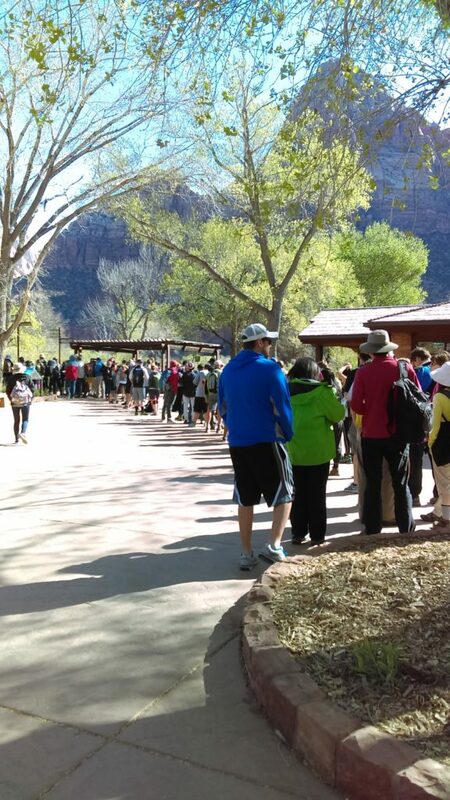 With 300 people regularly in line for the shuttle at the Zion Canyon Visitor Center, Burns said, having a ranger there to talk to those waiting and answer questions helps reduce frustration. Even though positive comments continue to roll in, Burns said, shuttle drivers are receiving more verbal abuse now than ever before. Even so, he said, the drivers soldier on and are as friendly as possible. 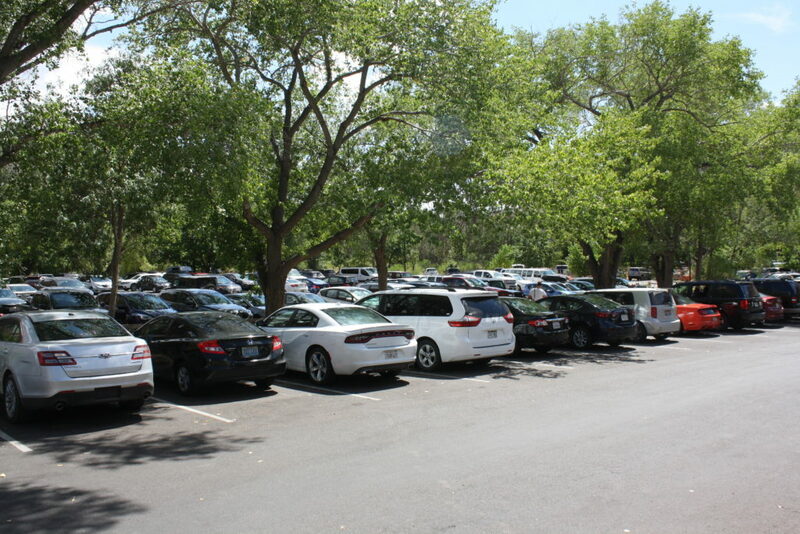 Park managers are currently collaborating with other local stakeholders to come up with a solution to the overcrowding. These include nearby municipalities, especially the gateway community of Springdale, as well as Washington County, Dixie National Forest, local tourism bureaus, and others. There have already been collaboration and listening sessions to discuss the problem and brainstorm possible solutions. Some of the options that are being heard over and over through these efforts, to name a few, are the following: more parking structures; a separate “express” entrance for park pass holders and/or locals; express shuttles up the canyon to specific trailheads run by local hotels or outfitters; and more promotion and development of additional facilities in nearby scenic and recreation areas. Bradybaugh told the Hurricane City Council that the park is currently working on a third entrance station at the south entrance to ease congestion. The superintendent’s goal is to give every park visitor a wonderful experience. The challenge is coming up with a solution and a way to achieve that lofty goal, he said. The next part of the visitor use management plan process will be public scoping starting in October. Burns said it will inform the public about proposed activities for the plan and solicit their comments regarding the plan. To keep apprised on what is going on with the Visitor Use Management Plan, citizens can keep checking the webpage dedicated to the plan process updates. 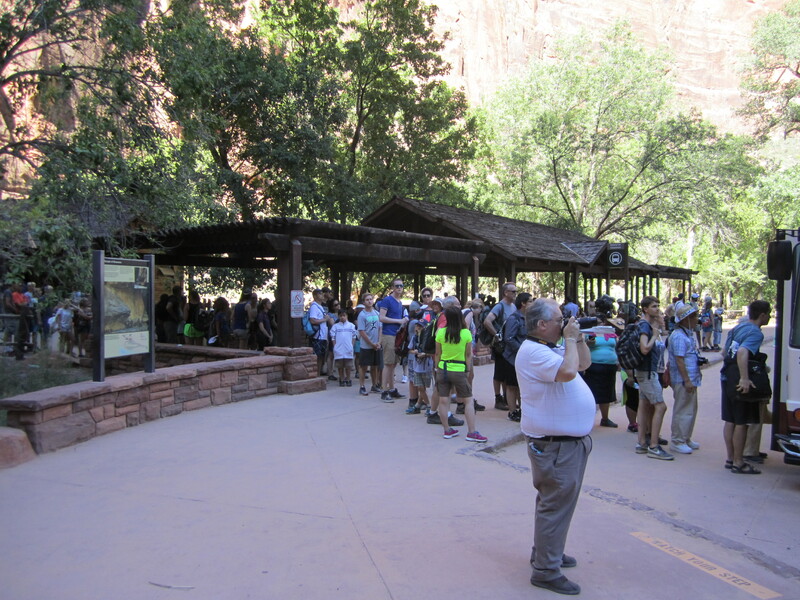 People can also sign for email updates emailing zion_visitor_use@nps.gov. This report is the first in a series on issues related to Zion National Park’s growth challenges and its ripple effects on surrounding communities. Forthcoming reports will address Springdale impacts including parking and transportation plans, local survey results and a variety of possible shuttle and busing solutions. I live Right Here, and Wouldn’t go there if you paid the Entrance Fee. Its Inane with Humans! We go there all the time it’s a wonderful place to visit. a place to spend time with friends and loved ones. there’s people in all the National Parks lol ! Well then digger better not go to Yellowstone. LOL. !